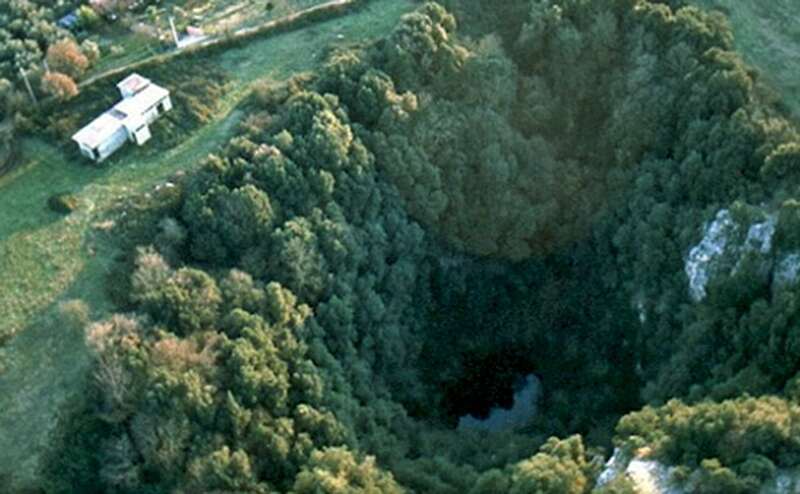 The second deepest known water-filled sinkhole – cave system is located in the vicinities of Rome. Recently none expected that the small lake in Pozzo del Merro might be almost 400 m deep. Pozzo del Merro is located in a comparatively plain place some 140 – 150 m above the sea level. It starts as a large, some 120 m long and 70 m wide hole in the ground. Steep, rocky walls of sinkhole are covered with thick vegetation. 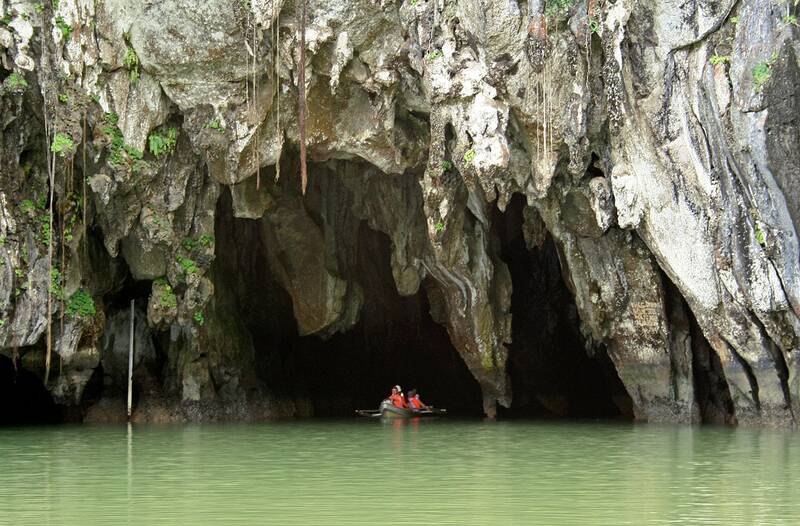 Water level is located 80 m below the surrounding area. Down, to the water, lead stairs built of stones. Here stand also abandoned constructions left by Rome water supply company – sometime in the past they had a project to supply the city with the clean water of Pozzo del Merro. Lake at the bottom of this sinkhole is small, maximum 27 m wide. It is covered with a thick blanket of waterplants Lemna. This unsighty lake was considered to be fairly deep – some thought that it might be 50 m deep, some – that even 90 m deep. There were told stories about people who got drowned in unexpected eddies in Pozzo del Merro – their corpses were found later in the sea. There is no reason to believe in these tales. Group of Italian cave divers and scientists (Giorgio Caramanna, Riccardo Malatesta and others) decided to find out the true depth of cave in the late 1990s. In spring 1999 they reached 100 m depth – but the sinkhole continued down into unknown depth. It was decided to continue exploration with remote controlled submarines – ROV. These devices were provided by special unit of Italian firefighters and there was arranged complex expedition with helicopters and other heavy equipment. In 2000 – 2002 a submarine "Mercurio" reached the depth of 210 m – it could not go further due to the length of connection cable. Sinkhole continued deeper without signs of ending. Next submarine – "Hyball 300" had a longer connection cable and it reached the depth of 310 m. Finally on March 19, 2002 there was used the ultimate minor submarine – "Prometeo" which reached the depth of 392 m. Here the abyss changes direction and continues horizontally into unepxlored passage. 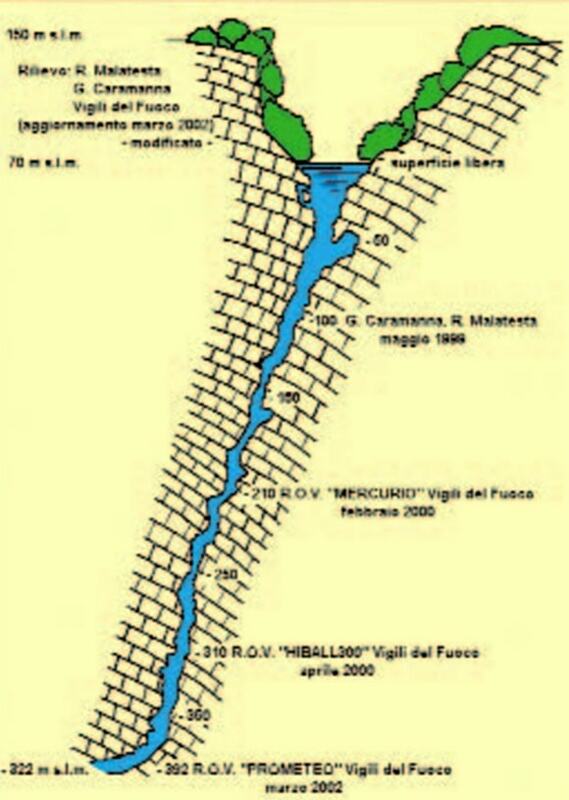 It is quite possible that Pozzo del Merro is even deeper. Thus Pozzo del Merro surpasses the more famous, incredible Mexican sinkhole El Zacatón, which is "only" 319 m deep. Only in the late September 2016 lake in one Czech cave – Hranice Abyss – surpassed the depth of Pozzo del Merro. This lake was dived up to the 404 m depth. Pozzo del Merro is located in protected natural area – "Riserva Macchia del Barco e Macchia di Gattaceca", near the Cornicolani Hills. This location is far from true wilderness – but it is comparatively wild if we remember that just 23 km from it is located the centre of the eternal city of Rome. Here, at the base of Appenines are located numerous interesting karst features – sinkholes, karst caves, travertine formations. South from Pozzo del Merro are located ancient, enormous mines of travertine, used up to this day. The beautiful town of Tivoli has developed around powerful springs with beautiful waterfalls falling over travertine formations. Sinkhole has formed in lower Triassic limestone layers buried deep below later sand, clay sediments and comparatively new, Quarternary tufa formed by eruptions of nearby volcanoes. Bottom of Pozzo del Merro lake is located 322 m below the sea level. Such geological formation simply could not form in common karst processes. Most likely volcanic heat and chemistry of nearby Vulcano Albano have helped to create this exceptional abyss. Groundwater deep in Triassic limestone was heated by volcanic heat and saturated with sulphur. This warm, acidic water rather quickly dissolved the limestone and there formed underground voids. Ceiling of void collapsed, debris was dissolved, ceiling of the void collapsed again and again, until it reached the daylight. Similar processes have created the amazing Sistema Zacatón in Mexico. Contrary to El Zacatón, Pozzo del Merro is narrow and skewed. The lake above is up to 27 m wide but then it narrows down to 4 – 5 m width. Water is rather chilly: 16° C.
In a few metres depth due to the dense cover of waterplants there is total darkness. Soon the water becomes very clear and transparent. Along the path downwards there can be noticed side passages, some up to 70 m long, dissolved by the warm, acidic water in the past. Sometimes the cave has several parallel vertical shafts and diver (rather – robot) can select which one to take. Only at the bottom the sinkhole expands to 30 m width. Bottom is covered with silty reddish deposits – insoluble particles of limestone. 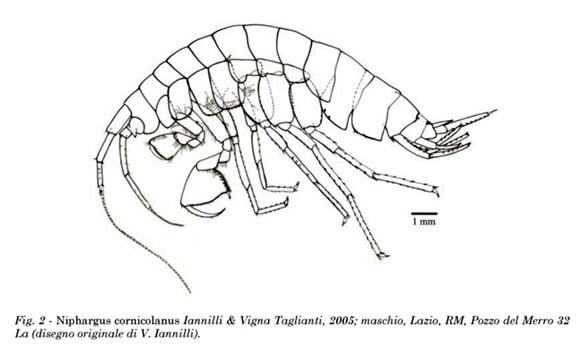 At the depth of 73 m there has been sampled small creature – a crustacean Niphargus cornicolanus Iannilli & Vigna-Tagl 2005. Most likely this is the only place in the world where this small crustacean lives. Unfortunately here have been found invasive species as well – turtle from America (Trachemys) and a dangerous fern Salvinia molesta D.Mitch. Such small ecosystems are very fragile and slight changes can erase unique communities of endemic species. Giorgio Caramanna, Speleologia subacquea e ricerca scientifica. 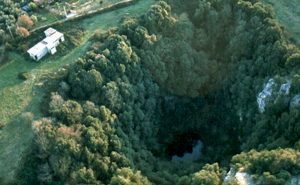 Un caso de studio: il "Posso del Merro" a i sinkholes della Piana di Tivoli. 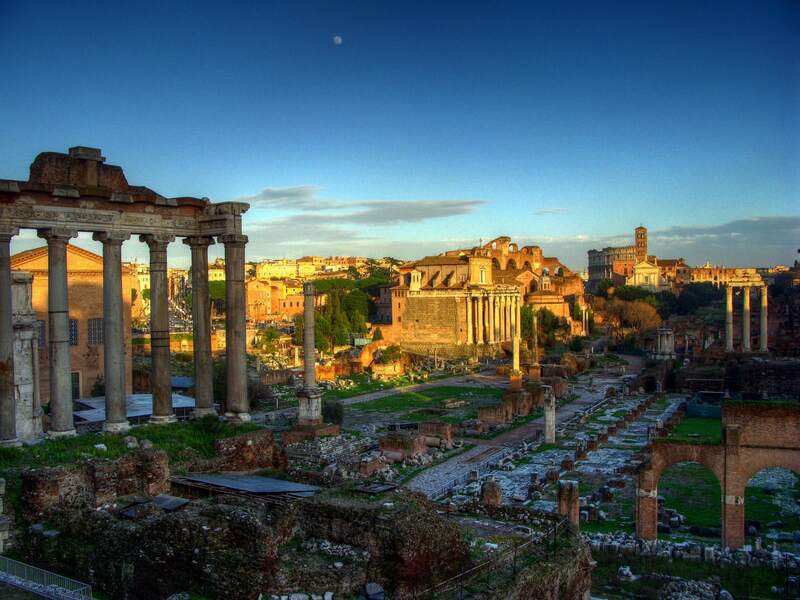 The book deals with the most striking landscapes and landforms of Italy. Attention is given to landform diversity and landscape evolution through time which has been controlled by very diverse geological conditions and dramatic climate changes that have characterized the Italian peninsula and islands since the end of the last glaciation. In addition, various examples of human impact on the landscape are presented. This lavishly illustrated volume draws a portrait of Italy through its most stirring panoramas, its characteristic villages, the architectural wonders marking its cities, the incredible archaeological vestiges of its past,.